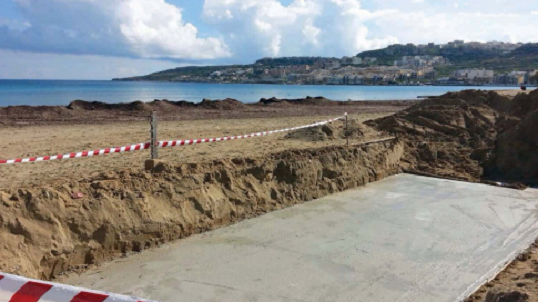 Mepa has used lenient planning rules introduced last year to allow the laying of a concrete platform for a kiosk on the sand at Għadira Bay, a Natura 2000 site the authority is tasked to protect. The planning authority approved a permit for the “upgrading” of a kiosk on the beach. The permit was issued without any impact studies having been carried out even though Għadira is designated as a Special Protected Area. applicability in the name of eliminating bureaucracy. Environmentalist and biologist Alan Deidun protested over the permit, given the site’s protection. “The encroachment on restricted public space on sandy beaches goes against the grain, especially when considering the high density of existing kiosks,” he said. He stressed Mepa’s actions were inconsistent with the recent decision to relocate the Munchies restaurant from the middle of Golden Bay to the side of the beach. “Why protect the sand dunes at Golden Bay and not coastal ones at Għadira?” he asked. In a statement reacting to the story, the planning authority said the kiosk was only one of seven similar applications at Għadira bay. Mepa said the “upgrading” of the kiosks was part of a plan by the Malta Tourism Authority to “embellish the area”. It also said the permitted upgrading works on the kiosk at Għadira were being carried out in accordance with a method statement which was assessed and endorsed by the Environment Protection Directorate. The plan to upgrade the kiosks lining the beach followed an agreement signed between the operators of the kiosks and government in 2012, according to Mepa. The kiosks will adopt a uniform design and ensure the proper collection and disposal of waste according to sanitary regulations. It said the permit, referred to as a Development Notification Order, was approved in May last year “after proper assessment was carried out”. The authority also said the permit for the upgrading of all the seven kiosks has been granted under the provisions of legal notice 115 of 2007 and subsequent amendments in 2011. More on Times of Malta and the e-paper on timesofmalta.com Premium.